The Gourmia GSV140 Sous Vide is a middle of road unit. It's well made, has plenty of power, and has a high GPM flow rate. It sacrifices remote connectivity for better pricing. The Gourmia Sous Vide GSV138 is a newer model and is usually available at a better price. $89.99 Current Price - YOU SAVE $38.10. 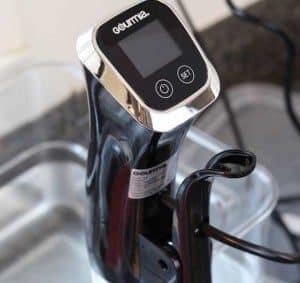 The Gourmia GSV140 Sous Vide Immersion Circulator is the mid-level product that sits between the Anova Bluetooth Sous Vide and the Budget Priced Sous Vide Models. This model gives you some upgrades but at a very reasonable $89.99 price point. 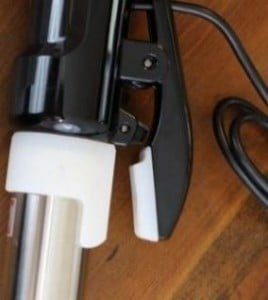 Like all Gourmia sous vide machines this features an alligator style clamp, you simply squeeze one end of the handle and slide it down over the edge of your cooking vessel. On the positive side, it's very easy to put up and take down. On the negative side, there's not a lot of room for adjustment, and it won't fit over the side of a thick-walled cooking vessel like an insulated cooler. This can be either a positive or negative depending on your style of cooking. This model measured 18" tall making it one of the tallest units we reviewed. The stainless steel tube was 2.5", and with the clip it came in at 3.5" across. This model also weighed 3.7 pounds making it one of the heavier models. This build quality of this model was very solid and good quality, we don't expect anyone would have issues with quality. All of the Gourmia immersion cookers that we looked at were 1200 watts putting them at the top of the power range. This means your cooking will progress much faster than other models. However, if you are cooking something with a long cooking time, you will have to be more concerned about evaporation. It has a maximum temperature of 203°F which is the lowest of all the Gourmia Sous Vide we reviewed but isn't an issue for most people as the majority of your cooking is done at a much lower temperature. The minimum water level is 2.75" and the maximum water level is 6". This is one of the narrower ranges, so again evaporation may be an issue. It's rated to heat 5 gallons of water which is average compared to other models. It's rated for 2.1 Gallons Per Minute flow rate, this means your water will circulate faster and come to temperature sooner. The noise level was average compared to the other models we tested. The nicest thing about this model compared to the other Gourmia models was the LED digital readout was on a slight angle, this makes it much easier to read than the others models which are flat on top. One weird aspect is the scroll wheel that's used to set the temperature is on the back. This is a little awkward as you're always reaching around and feeling for it because you can't quite see it. Originally this unit came in a variety of colors such as white, gold and a dark purple. Currently, the only color being made is the purple the other colors are only available from second-hand resellers and can get somewhat pricey. There is no WiFi or Bluetooth connectivity on this model. To conclude, the GSV140 Sous Vide Precision Cooker is a well-made unit that will make your sous vide cooking both fast and easy. It's a little larger and heavier than most, and the clamp and controls are a little awkward but aren't deal-breakers. If you don't need remote connectivity, this model may work well for you. We do recommend you look at the Gourmia Sous Vide GSV138 it's a newer model, with slightly more features and better pricing. 17" x 3.5" x 3.5" 14.8" x 2.8" x 2.8" 12.8" x 2.2" x 4.1"
The Gourmia GSV140 Sous Vide is an older model sous vide, it's a good quality, but not the best value. The Gourmia Sous Vide GSV138 is a new model with more features available at a better price.